Elmhurst is a complicated neighborhood in western Queens. It has come a long way since troubles in the 1980s, even longer since its colonial founding in the 1650s. Elmhurst is the thriving region of multifamily homes, and co-op and apartment buildings. Immigrants, especially from Asia and Latin America, have made Elmhurst the most diverse part of Queens. One of the first European towns in Queens was present-day Elmhurst. Its original name in 1652 was Middleburg, and then in 1662 New Towne (soon just Newtown). When Queens became part of New York City in 1898, the name changed to Elmhurst, at the bequest of Cord Meyer developers, in order to distance it from polluted Newtown Creek. The area developed rapidly in the early 20th century, spurred by the subway's reach out into Queens. A mostly Italian and Jewish neighborhood, it began to change in the 1960s, as families left for the suburbs, replaced by immigrants from around the world. Elmhurst is in western Queens. Roosevelt Avenue is the neighborhood's northern boundary with Jackson Heights. To the east is Corona at Junction Boulevard. Woodside is to the west along 74th Street and the LIRR tracks. Elmhurst dips south of Queens Boulevard to the Long Island Expressway (and Rego Park, Middle Village, and Maspeth). The area below Queens Boulevard, especially south of the LIRR tracks, is a sleepy area of row houses, multi-family homes. The neighborhood used to go further south to Eliot Avenue, but a zip code change added a sliver of "South Elmhurst" to Middle Village. Elmhurst has the most subway options in Queens outside of Long Island City. Subways include the 7 train that runs locally above Roosevelt Avenue, the express E and F at Broadway/74th Street, and the R, V trains that run local down Broadway and out along Queens Boulevard. It takes about 30 to 40 minutes to reach Midtown Manhattan. Main thoroughfare Queens Boulevard is busy, fickle, and all but essential. There's easy access to Brooklyn Queens Expressway and the Long Island Expressway. Neighborhood streets, especially conduits like its commercial heart of Broadway, can get jammed fast during rush hours. Multi-family homes on tight lots are the most common housing, with plenty of four-to-six story apartment buildings and some coops and newer condos, along the main roads. Many of the multifamilies are owner-occupied rentals, and "Fedders-style" housing has become common. The occasional blocks of early 20th-century row houses are sometimes glorious, but sometimes rundown. Elmhurst suffers from a lack of parks. Moore Homestead Park is a few acres of busy blacktop, for handball, basketball, and quieter games of chess and Chinese chess. For a student of architecture or diversity, the neighborhood's religious buildings are fascinating. You can find Christian churches with roots in the colonial era whose congregation is Taiwanese, historic St. Adalbert Church, the main Thai Buddhist temple in New York City, a Jain temple, a Chinese Chan Buddhist hall, and the beautiful Hindu Geeta Temple. A lively, diverse population makes Elmhurst one of the most interesting New York City neighborhoods for food. You'll find great Thai, Indonesian, and Argentinian. Taste Good is a homey, totally delicious spot for Singapore-style noodle soups and meals. It's a must for foodies in Queens. Next door the Hong Kong Supermarket has it all. Close to the Queens Center Mall, the Georgia Diner is a can't miss, long-time fave. Ping's Seafood is also a long-time favorite for Chinese dim sum and seafood. Home to the Queens Center Mall and the Queens Plaza Mall, Elmhurst's stretch of Queens Boulevard is one of the largest shopping districts in the borough. Broadway, centered at Whitney, is a commercial heart of Newtown, especially for Chinese and Southeast Asian stores and restaurants. 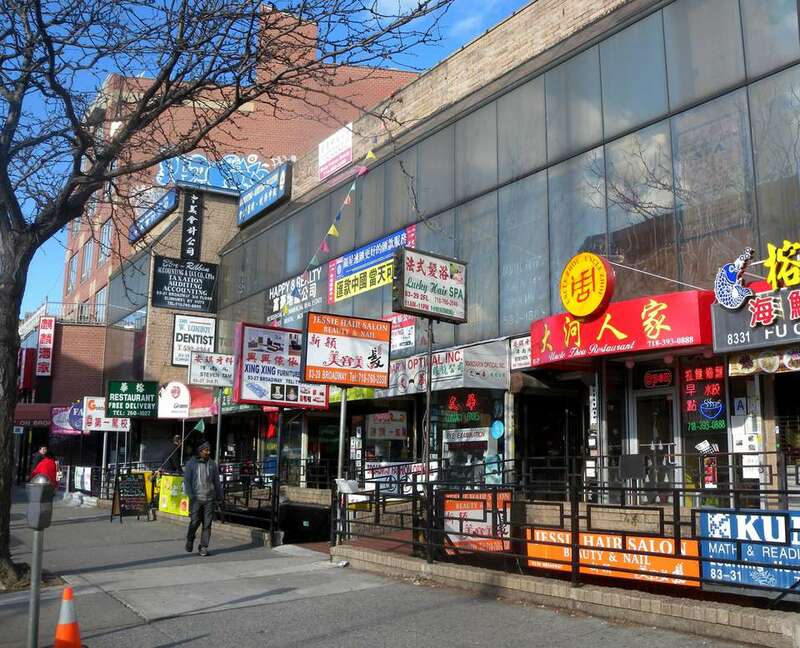 Under the elevated tracks of the 7 train along Roosevelt Avenue is another big commercial strip, shared with Jackson Heights, of Latino shops, clubs, bars, and restaurants. For a real and calm neighborhood walk in Elmhurst, you can't beat the small shops and restaurants along prosperous Woodside Avenue, near Elmhurst Hospital Center.